Princes Risborough Baptist Church began life in 1707. For over 300 years a group of the Lord's people, based at the site on Bell Street, have served God as disciples of Christ in this community. Our Minister is Rev Vanessa Rye. The Leadership Team, which comprises Minister and Deacons, is supported by a number of key committees who oversee different aspects of our Church life. As we follow in the footsteps of those who have gone before us we express our commitment to Jesus Christ through our present Mission Statement and Core Values. As we do so our trust and confidence is in the faithfulness of God who has kept and guided the fellowship through all these years. care for one another, and to share our good news with everyone. Gives freely of its time, gifts and financial resources. Brings joy and reverence to the worship of God. Reaches out with the Good News both near and far. Is aware of the beliefs and needs of the society in which it lies. Princes Risborough Baptist Church is a member of the Baptist Union of Great Britain (now Baptists Together) and the Central Baptist Association. We are actively involved in Churches Together in Risborough. Princes Risborough Baptist Church is committed to mission both nationally and internationally, as well as locally. In our local evangelism we have made use of Christianity Explored and The ALPHA Course. A quarter of our annual income supports different national and international missions. Feel free to use EasyFundraising to help us raise funds. One of the main ways in which we express our commitment to serve the community is by hiring out our halls and rooms to local organisations. 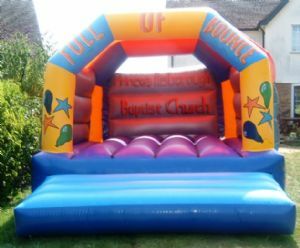 We also let our halls for private parties and other functions; and have our own Bouncy Castle for children's parties.